Tamaulipas (Spanish pronunciation: [tamau̯ˈlipas] ( listen)), officially the Free and Sovereign State of Tamaulipas (Spanish: Estado Libre y Soberano de Tamaulipas), is one of the 31 states which, with Mexico City, comprise the 32 Federal Entities of Mexico. It is divided into 43 municipalities and its capital city is Ciudad Victoria. ^ a. The state's GDP was $266,102,228 thousand of pesos in 2008, amount corresponding to $20,789,236.56 thousand of dollars, being a dollar worth 12.80 pesos (value of June 3, 2010). 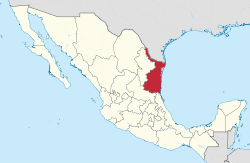 Located in northeastern Mexico, it is bordered by the states of Veracruz to the southeast, San Luis Potosí to the southwest, and Nuevo León to the west. To the north, it has a 370 km (230 mi) stretch of the U.S.–Mexico border along the state of Texas. The name Tamaulipas is derived from Tamaholipa, a Huastec term in which the tam- prefix signifies "place (where)". No scholarly agreement exists on the meaning of holipa, but "high hills" is a common interpretation. Another explanation of the state name is that it is derived from Ta ma ho'lipam ("place where the Lipan prey"). In addition to the capital city, Ciudad Victoria, the state's largest cities include Reynosa, Matamoros, Nuevo Laredo, Tampico, and Mante. The area known as Tamaulipas has been inhabited for at least 8,000 years. Several different cultures (north coastal, south coastal, lowlands, and mountains) have come and gone during that period. Tamaulipas was originally populated by the Olmec people and later by Chichimec and Huastec tribes. Between 1445 and 1466, Mexica (or Aztec) armies commanded by Moctezuma I Ilhuicamina conquered much of the territory and transformed it into a tributary region for the Mexica empire. However, the Aztecs never fully conquered certain mostly nomadic indigenous groups in the area. Although Hernán Cortés conquered the Aztecs rather quickly, a gradual process was needed for Spain to subjugate the inhabitants of Tamaulipas in the 16th and 17th centuries. The first permanent Spanish settlement in the area was Tampico in 1554. Further settlement was done by Franciscan missionaries; widespread cattle and sheep ranching by the Spanish bolstered the area's economy while forcing native populations from their original lands. Repeated indigenous rebellions kept the area unstable and weakened colonial interest in the region. What is now Tamaulipas was first incorporated as a separate province of New Spain in 1746 with the name Nuevo Santander. The local government capital during this time moved from Santander to San Carlos, and finally to Aguayo. The territory of this time spanned from the San Antonio River to the northeast to the Gulf of Mexico, then south to the Pánuco River near Tampico and west to the Sierra Madre Mountains. The area became a haven for rebellious Indians who fled there after increased Spanish settlements in Nuevo León and Coahuila. In the mid-17th century, various Apache bands from the Southern Plains, after acquiring horses from Europeans in New Mexico, moved southeastward into the Edwards Plateau, displacing the native hunting and gathering groups. One of these groups was known as Lipan (see Hodge 1907 Vol. I:769 for a confusing list of synonyms). After 1750, when most Apache groups of the Central Texas highlands were displaced by Comanche and moved into the coastal plain of southern Texas, the Europeans of the San Antonio area began referring to all Apache groups in southern Texas as Lipan or Lipan Apache. Many Indian groups of missions in southern Texas and northeastern Mexico had recently been displaced from their territory through the southward push by the Lipan Apaches and were still hostile toward Apaches, linking arms with the local Spanish authorities against their common foe. By 1790, Europeans turned their attention from the aboriginal groups and focused on containing the Apache invaders. In northeastern Coahuila and adjacent Texas, Spanish and Apache displacements created an unusual ethnic mix. Here, the local Indians mixed with displaced groups from Coahuila and Chihuahua and Texas. Some groups, to escape the pressure, combined and migrated north into the Central Texas highlands. In 1824, after the Mexican War of Independence from Spain, and the fall of the Mexican Empire, Tamaulipas was one of the 19 founder states of the new United Mexican States. During the fights between centralists and federalists that soon followed, the successful Texas Revolution led to the creation of the Republic of Texas in 1836. The new republic claimed as part of its territory northern Tamaulipas. In 1840, it became a part of the short-lived Republic of the Rio Grande. 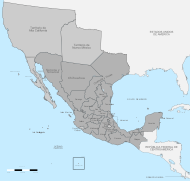 In 1848, after the Mexican–American War, Tamaulipas lost more than a quarter of its territory via the Treaty of Guadalupe-Hidalgo. Its capital was kept at Aguayo, which later was renamed Ciudad Victoria in honor of Guadalupe Victoria, first President of Mexico. The French occupation and reign of Emperor Maximilian during the 1860s was difficult for Tamaulipas, at least on the borders and in the city of Tampico. Portions of Tamaulipas supported the republican forces led by President Benito Juarez in resisting the French, especially in the north. Two years after French occupation began, Tamaulipas as a state finally acceded to Maximilian's rule, and the last French soldiers left the state in 1866, leading up to Maximilian's execution and fall of the Second Mexican Empire in 1867. However, the years after Maximilian's defeat were ones of rebuilding and great growth in Tamaulipas. International trade began to blossom, especially with the coming of the railroad to Tampico, which was developing as not only a port city, but also as an industrial and commercial center. The railroad allowed goods to flow quickly from the mines and cities of the interior and the Texas border to Tampico for processing and shipment. This, in turn, caused significant growth in towns such as Matamoros and Nuevo Laredo. Since the revolution of 1910, successive governments have dedicated themselves to building industry and infrastructure in Tamaulipas, including communications and educational systems. Norberto Treviño Zapata founded the state university system, as well as reformed the state oil industry. Marte Gómez provided increased farm sizes for private family farmers. And more recently, Emilio Martínez Manautou led industrial growth. Lately a push has been to strengthen fishing, including efforts to increase the price of fish and shellfish on the international market. The Tropic of Cancer crosses the southern part of the municipality of Victoria. The coastal plains along the Gulf have a large presence in the state, whereas inland the landscape is adorned by cactus species and pasture. Predominant fauna in the region include the cougar (Puma concolor), long-tailed weasel (Mustela frenata), ocelot (Leopardus pardalis), American badger (Taxidea taxus), North American beaver (Castor canadensis), plain chachalaca (Ortalis vetula) and quail. In the western part of the state, the Sierra Madre Oriental displays warm valleys and high sierras with peaks reaching 3,280 m (10,760 ft) in the Pedragoso Sierra; 3,240 m (10,630 ft) in the Borregos Sierra; 3,220 m (10,560 ft) in La Gloria Sierra; 3,180 m (10,430 ft) in Cerro el Nacimiento; and 3,000 m (9,800 ft) above sea level in the Sierra el Pinal. The Sierra de Tamaulipas and the Sierra de San Carlos are isolated mountain ranges in eastern Tamaulipas. In terms of hydrology, the Bravo, Purificacion, and Guayalejo Rivers flow into the Gulf of Mexico after crossing the state from the western inland. On their way, their basins and zones of influence naturally correspond to the areas destined for agricultural use. The Rio Grande, known to Mexicans as the Río Bravo, represents the northern frontier shared with the United States. One of the tributaries of this natural border, the San Juan River, feeds the Marte R. Gómez Dam. Agricultural and cattle-raising activities are served by 14 other dams across the state, with a total capacity of 7,500 million m3 of water. As much as 90% of the state reports a dry or semidry climate, while the Huasteca mountain range presents hot and semihumid conditions, along with humid winds coming from the Gulf, which means it is located in a zone highly influenced by cyclones, with predominant winds coming from the east and southeast. Northern Tamaulipas shares its economic culture with that of Texas, and is primarily characterized by agriculture and strong growth in all industrial sectors. This region is home to many of the maquiladoras, factories owned by foreign companies but worked by Mexicans, primarily by women. Southern Tamaulipas' economy is based primarily on the petrochemical industries. There are petrochemical production plants around Altamira as well as a principal Gulf coast container port, refinery facilities in Ciudad Madero and many oil-industry support service companies in Tampico, as well as a major general and bulk cargo port. Also of importance are the tourism and fishing industries, as well as much commercial shipping, based in Tampico and Altamira. The little village of La Pesca, in the municipality of Soto La Marina, about midway between Brownsville, Texas and Tampico, is a rapidly growing tourist area with lovely beaches and excellent fishing both in the Gulf of Mexico and the Rio Soto La Marina. The central zone contains the capital, Ciudad Victoria, and is home to much forestry and farming, as well as some industrial development. About 30% of the population lives here, both in the capital and in Ciudad Mante. Ciudad Victoria is a significant educational center, home to the Autonomous University of Tamaulipas (which also has campuses in other cities in the state), the Regional Technical Institute of Ciudad Victoria, the University of Valle de Bravo, and other institutions of learning. As of the 1990 Mexican census, 13 percent of the homes had only dirt floors, nearly 19 percent had no running water, and over 15 percent of the homes had no electricity. This was better than the national average, but was skewed because of the high rate of development in the urban centers. In rural communities in Tamaulipas, access to running water was available in less than 40 percent of homes. As of 2005, Tamaulipas's economy represents 3.3% of Mexico's total gross domestic product or 21,664 million USD. Tamaulipas's economy has a strong focus on export oriented manufacturing (i.e. maquiladora / INMEX). As of 2005, 258,762 people are employed in the manufacturing sector. Foreign direct investment in Tamaulipas was 386.2 million USD for 2005. The average wage for an employee in Tamaulipas is approximately 240 pesos per day, $2.00 to $3.00 an hour. Tamaulipas enjoys standards slightly higher than the national averages, since illiteracy has been reduced to 5% for those over 15 years of age, average schooling reaches 7.8 years, and as many as 11% have earned a professional degree. José Ángel Gurría Treviño, diplomat and economist, Secretary-General of the OECD. Manuel González Flores, general and politician who served as president of Mexico from 1880 to 1884. Max Appedole, film producer, author, businessman, politician, activist. Emilio Portes Gil, president of Mexico after the death of Alvaro Obregon in 1928. Juan Nepomuceno Guerra, smuggler/founder of C.D.G. The current anthem of the state of Tamaulipas is Himno a Tamaulipas [es], composed in 1926 by Rafael Antonio Pérez Pérez, set to music by Alfredo Tamayo Marín. Normally, only the chorus, first verse and chorus are sung in public. The region that slumbers on the banks of the river. The glorious memory of their heroes and honor. That in dire times gave their blood and lives. And all Tamaulipas vibrates to the voice of freedom. de tus heroes en marcha triunfal. Who were lit by the light of knowledge. With their labors and immortal name. Of your heroes' triumphal march. con tu valor fuiste el honor de nuestro suelo. y tu espada fue siempre inmortal. With your courage you were the honor of our soil. And your sword was always immortal. fuente de amor en el hogar tamaulipeco. que engalanan el patio vergel! con el mirto, la oliva y laurel. Source of love in the Tamaulipecan home. That adorn the courtyard garden! With the myrtle, olive and laurel. bajo el fuego que te hizo inmortal. Under the fire that made you immortal. floreciendo en la santa hermandad. Flourishing in the holy brotherhood. To improve their status as citizens. That the worker strives to achieve. Is to know death or victory.. This state is known to be the site of a territorial struggle for both the Gulf Cartel and Los Zetas. The resulting deaths and unresolved kidnappings from the gang violence have been described as a "humanitarian tragedy". ^ "Las Diputaciones Provinciales" (PDF) (in Spanish). p. 15. Archived (PDF) from the original on 2011-06-07. ^ "Senadores por Tamaulipas LXI Legislatura". Senado de la Republica. Archived from the original on September 24, 2015. Retrieved April 7, 2011. ^ "Listado de Diputados por Grupo Parlamentario del Estado de Tamaulipas". Camara de Diputados. Archived from the original on July 20, 2011. Retrieved April 7, 2011. ^ "Resumen". Cuentame INEGI. Archived from the original on May 11, 2013. Retrieved February 12, 2013. ^ "Relieve". Cuentame INEGI. Archived from the original on June 18, 2010. Retrieved April 7, 2011. ^ "Encuesta Intercensal 2015" (PDF). Archived (PDF) from the original on December 10, 2015. Retrieved December 9, 2015. ^ "Reporte: Jueves 3 de Junio del 2010. Cierre del peso mexicano". www.pesomexicano.com.mx. Archived from the original on June 8, 2010. Retrieved August 10, 2010. ^ "Tamaulipas" (PDF). SRE. Archived (PDF) from the original on April 21, 2011. Retrieved April 7, 2011. ^ "Historia". Gobierno del Estado de Tamaulipas. Archived from the original on December 23, 2010. Retrieved April 7, 2011. ^ (Campbell and Campbell 1981:62–64). ^ "Puerto de Tampico". Ports in Mexico. World Port Source. Archived from the original on 2009-10-19. Retrieved 2009-12-17. ^ a b Industrial Costs in Mexico – A Guide for Foreign Investors 2007. Mexico City: Bancomext. 2007. p. 102. ^ "Encuesta Intercensal 2015" (PDF). INEGI. Archived (PDF) from the original on 2015-12-10. Retrieved 2015-12-09. ^ "Link to tables of population data from Census of 2010". Inegi.org.mx. Archived from the original on 2017-06-29. Retrieved 2013-06-30. ^ "2010 U.S. Census Data Link to tables of population data from Census of 2010". census.gov. Archived from the original on 30 December 2012. Retrieved 2 May 2018. ^ "McAllen Overview". McAllen Chamber of Commerce. Archived from the original on 25 August 2011. Retrieved 26 August 2011. ^ "Estadísticas INEGI Población en Matamoros". Copyright © 2011 matamoros.com. Archived from the original on 2011-09-01. ^ "Matamoros-Brownsville". World Gazetteer. Archived from the original on 13 May 2012. Retrieved 22 August 2011. ^ Tapio, Helen. "B. Traven's Identity Revisited". Helsinki Historia. Historical Association. Archived from the original on 12 January 2017. Retrieved 17 June 2016. ^ "HIMNO A TAMAULIPAS". Archived from the original on 2011-07-07. Retrieved 2012-09-17. ^ "Impone EU 'toque de queda' a sus empleados consulares por narcoviolencia en Tamaulipas - Proceso". proceso.com.mx. 4 January 2015. Archived from the original on 12 December 2017. Retrieved 2 May 2018.